That is my one-word from God for 2014. But there is a second word (we’ll get to that story in a minute). I admit, ‘hope’ hasn’t really been a pressing thought in my head. It’s more like background music I’m oblivious to, most of the time. I see inspiring quotes and Bible verses with the word ‘hope’ in them constantly, and definitely, it encourages me. Lately, however, hope hasn’t so much meant the presence of hope but more like the absence of hopelessness. Semantics, maybe. But I don’t think they are the same thing. It’s more like one (absence of hopelessness) is the precursor of the other (hope). Hope shows up at times when I’m tempted to be hopeless. Then, in its place, hope appears. However, a few weeks ago, Hope with a capital ‘H’ showed up. A little backstory: A big part of my infertility struggle has been wondering if this was really going to happen. My struggle hasn’t been whether or not God could do it; it’s been whether or not He would. I know enough to know that He is my only hope in this (no pun? intended). I have confidence in what doctors and technology can do, but they aren’t God. They can’t create life nor make it grow. There are many women, just like me, who either are or have been in the same situation: dealing with infertility issues, waiting on God. But many of these girls have gotten some word from God, some sign, that this was going to happen for them. Just a matter or time. I’ve wanted to believe that for myself, but God has never told me that. The closest I’ve come to that was last summer when I was having my quiet time. God used several verses to encourage my heart about having children some day. It was kind of surprising to me because at the time, I wasn’t really praying about getting pregnant and my infertility issues weren’t really on my radar either. But if you know me at all, you would know that, for me, that’s not enough. Call it a lack of faith, skepticism, whatever – but I’m always erring on the side that maybe, possibly, I got it wrong. Maybe I was reading into it. Well, a few weeks ago, God spoke up a little louder. We had just finished our inservice days, and at our school, we end them with worship and prayer together. As we were packing up to leave, Lucy, one of my co-workers approached me. Lucy and I are friendly at work – ‘work-friends.’ As department chairs, we have lots of meetings together, but our classrooms are in separate ends of the building, not leaving much time for anything more than casual chit-chat in the teacher’s room. I doubt that she knows much – if anything – about my infertility struggles – unless she heard it through the grapevine. “Lucy came up to me and said that while she was praying, God put me on her heart. And wouldn’t let up. During our prayer time, God kept drawing her attention to me. She said she felt the Holy Spirit churning inside of her, and she knew she had to come find me. “Lucy went on to tell me, from God, that this is not the last resort; the doctors don’t matter. I was to keep crying out to the Lord, like Hannah. Keep knocking. God hears my prayers; He hasn’t forgotten me. He will give me a child in His time…and I am to remember that when God gives us a baby. This baby is His, and we are to dedicate it back to The Lord. The word God gave me this year is Hope. 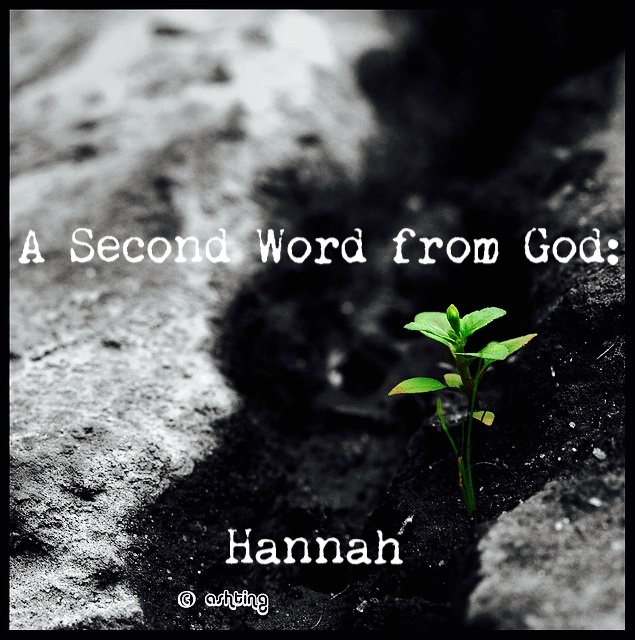 The second word God has given me is Hannah. And while I wouldn’t say there have been lightning bolts and writing in the sky speaking words of hope to me, I would say that hope has been the under-current of these past few months. It’s like the moving sidewalk in the airports; hope has been carrying me along, from one place to the next. Most significant, I think, has been hope’s effect on my disappointments. It’s April. That means I’ve had 4 negative pregnancy tests. One failed IUI. A few months ago, I would have been depressed for a few days. There would have been tears. Lots of them. Questions. A whole series of mental and emotional gymnastics that would have worn me out. But there haven’t been. Was it a let-down to only see one line on the stick? Yup. Did my heart drop? Yes. But only for a minute. After that, truth sets in: it’s just not time. Crying over it is not going to make it happen any sooner. So, the stick gets tossed in the trash, and it’s on with my day. That’s what hope has been looking like these days: a negative pregnancy test thrown in the trash and no tears afterwards. And one day, hope will look like Hannah – hope fulfilled, a prayer answered, a baby in my arms, offered back to the Lord. In the meantime, Hope just got a little louder. Thank you! I'm in this for the long haul! Our daughter and son-in-law are also struggling with infertility. They've been married for 8 years. I don't believe they can afford to go through medical treatments and they are nervous about adoption. Our son-in-law is Armenian and would love to adopt an Armenian child, but God surely does know exactly what will meet the desires of their hearts. A year or so ago I was doing a Bible study and "happened" upon this verse: "I prayed for this child, and the Lord has granted me what I asked of him." I Samuel 1:27 This leapt off the page for me and I've been hanging onto it and sharing it with others. So when I read your story, of course it renewed my hope afresh. God is not slow concerning His promises. Hold on to every promise you've been given. Thank you so much, friend. You have no idea how much that means to me. I pray for you always, too. When I go on my walks, I run through my list of blog friends I'm praying for (by user-name, lol) - but He hears!!! Our day will come! Thanks, Caroline! You were one of the girls I was thinking of - with your blue sock moments! You are right, God encourages us when we need a little something to hang on to! Praying for you, friend!! How sweet and precious! Maybe these two words (names?) are prophetic! Perhaps God will send you two baby girls that you will name Hope and Hannah. :) God is with you, and He is strengthening you in the waiting process. Praying for you every day. I love that! Thank you, Cheryl! God has been so good to me to bring me these encouragements along the way. Thank you so much for your prayers! I do not take them for granted for one minute! Love this: "Hope just got a little louder." You always write from your beautiful heart and it brings tears and hope to many. You are such a strong woman, God has blessed you already and I am confident He will bless you even more! Congrats!! What an amazing testimony! Only God knows why we go through these struggles, but the joy is exponential when He answers our prayers. Thank you so much for coming by and sharing your story! Pray it was a wonderful day of celebration! This post just made me smile from ear to ear. Your journey of finding hope is bringing it to others. Love that.